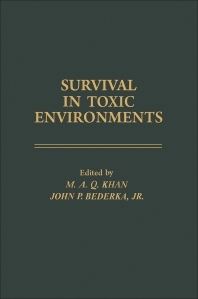 Survival in Toxic Environments is a collection of papers presented at a symposium held in Houston, Texas, in December 1973 and organized by the American Society of Zoologists, Division of Comparative Physiology and Biochemistry. Contributors focus on chemical pollutants, as well as the pollutants’ fate and disposition in the environment and bio-environmental effects. The specific pollutants and/or toxicants include pesticides, crude and refined oils, polychlorinated biphenyls, polycyclic aromatic hydrocarbons, nitrilotriacetic acid, lead, carbon monoxide, and other supposedly less ominous xenobiotics. The dispositions of these substances and their effects are examined in either ecosystems and/or organisms, or components thereof. This volume is organized into five sections encompassing 21 chapters and begins with an overview of chemicals, how they are degraded, and how they affect living organisms. The first section discusses the impact of chemical pollutants, such as DDT, on the biology of organisms. The second section explores the detoxication mechanisms of survival in toxic environments, emphasizing halogenated hydrocarbons and their fate in microbes, houseflies, and fish. The reader is then methodically introduced to the role of the mixed-function oxidase and its components in survival in toxic environments, along with the trends in pesticide research. The final section considers non-pesticidal pollutants, such as NTA (a detergent builder), lead, and carbon monoxide, and their secondary effects. This book will be of interest to scientists and researchers in fields such as chemical pharmacology, chemical pathology, biology, zoology, ecology, agricultural chemistry, and entomology.